Miso ramen is a Japanese noodle soup with a broth seasoned with miso and served with a variety of vegetables and garnishes. 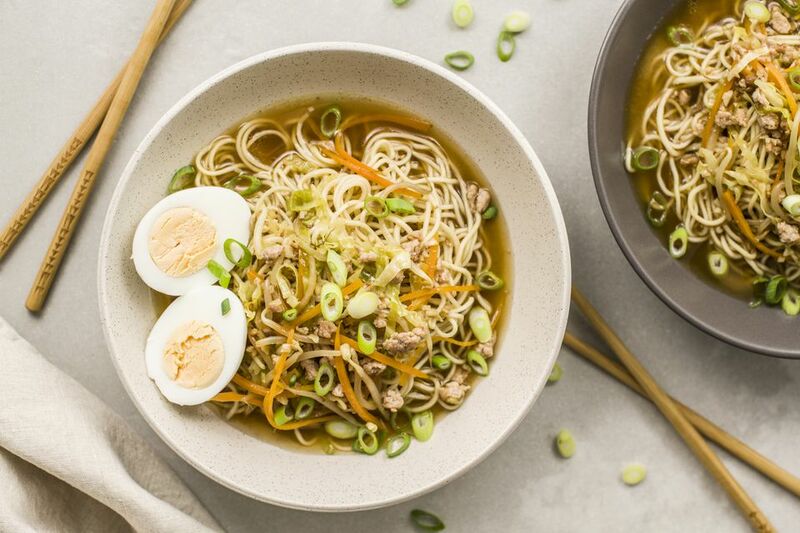 The miso broth recipe for this dish is made from the chicken base, ground pork, and vegetables, while the noodles are fresh, pre-made chukamen-style Chinese noodles that cook quickly and taste quite good. Some garnishes you may want to offer alongside the ramen include chopped green onion, hard-boiled egg (or soy sauce egg also known as shoyu tamago), fish cake (kamaboko) slices, roasted white sesame seeds, pickled bamboo shoots (menma), kikurage wood ear mushrooms, and boiled spinach. Heat canola oil in a large deep skillet or a wok over medium-high heat. Add minced ginger, garlic, and ground pork to the skillet and saute on medium heat until the pork is done. To the skillet with the meat, add carrot, bean sprouts, and cabbage and saute together for a few minutes until vegetables are tender. Pour warm water into the skillet. Season with chicken bouillon powder or chicken base, sugar, and soy sauce and bring the soup to a boil. Turn down the heat to low, and melt miso in the soup. Add sesame oil last, and then turn off the heat. In the meantime, prepare the noodles. Boil water in a large pot. Put chukamen noodles into the boiling water and cook for a few minutes, until the noodles are al dente, or reach your desired firmness. Drain the noodles well and serve in two deep soup noodle bowls. Pour the hot miso soup mixture with pork and vegetables over the noodles. Substitute ground pork with ready-made, thinly sliced charsiu pork from the deli section of your local Japanese or Asian market. Other types of ground meat also work, for example, ground chicken, ground turkey, etc. If you like shredded chicken, this may be used as well. For the miso paste, try white miso, or awase miso which is a mixture of red and white miso paste. If a Japanese or other Asian grocery store is not available to you, try substituting the fresh chukamen noodles with the dried noodles for making instant ramen. If you opt to use dried noodles for this recipe, toss out the seasoned soup base enclosed with the dried noodles as you will be making a delicious miso broth instead.